Velocity 2X is a game that’ll make you shout “hell yeah!” and “god dammit!” often within the span of roughly two seconds. It’s a game so fast-paced that it actually made me, someone who learned to play games with Contra and Robotron 2084, feel like I was lagging behind the action. Part-Xevious and part-Sonic the Hedgehog, Velocity 2X has a need for speed and not much else, but that’s all it, well, needs. It’s at its best when you’re zooming downrange in a spaceship in one moment and dashing down a hallway while dodging deadly hazards the next. It misses beats here and there, but for the most part it’s an all-around winner that’ll keep you hooked — so long as it doesn’t completely overwhelm you. Gotta go fast –- In many games, speed is your reward. Sonic the Hedgehog lets players cruise through levels at crazy speeds if they know where to jump and where to roll. Super Meat Boy encourages players to experiment with sprinting so they know where to wind up after a tricky set of jumps or a particularly nightmarish obstacle. Velocity 2X takes that idea and runs with it (pun intended), immediately opening with one simple instruction: hold the right bumper to go faster. Way faster. And while your vehicle, the Quarp Jet, can’t handle impacting a wall even once, it can zip through each segmented level at impressive velocities and teleport through thin obstacles at the push of a button. After I’d finally cleared a level enough, I was ready to run through it with RB held the whole way through, a perfect score in my sights. This is further expanded upon with platforming segments where sprinting through levels is a risky-but-rewarding venture that could easily wind up with you face-first in a laser grid. A visual blast from the past -–Remember Another World and Flashback? They were Amiga games with unique, vector graphics-style presentations that allowed them to push out extremely detailed levels without having to worry about RAM and other limitations that came from using sprites. While RAM limitations in 2D games aren’t much of a problem anymore, they used to force a certain visual flair by necessity that has been lost to time. 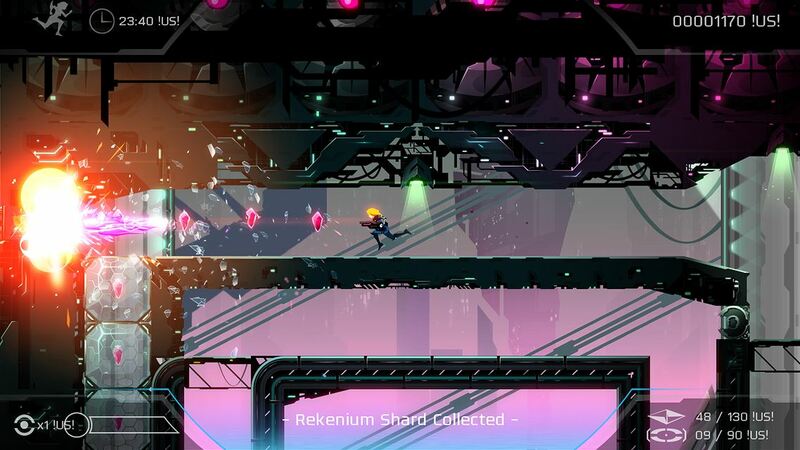 Velocity 2X takes that style and runs with it — sometimes literally — and it’s gorgeous. The minimalist approach to characters and environments makes every level feel that much more alive due to how distinct everything looks and how fluidly characters animate. It’s a feast for the eyes that goes by at a slick 60 frames per second, complemented by tight controls and an upbeat electronic soundtrack. Angry blurs –- Each level ranges from extremely short (under a minute) to impressively long (upwards of four or five minutes). So while blasting through each level is certainly an option, you won’t be getting much reward for it. To really dominate the leaderboards, you’re going to need to rescue every hostage, blow up every enemy, collect every collectible and finish the level as fast as you can. And that kind of stuff isn’t just individual, no; the greatest challenge Velocity 2X offers is asking you to do all of that simultaneously. Why? Who cares? You probably tried to three-star every Angry Birds level way back in 2009, and this is no different. Well, it is, but you get the idea. A whole new dimension –- If you’re unaware, Velocity 2X is the sequel to the PlayStation exclusive Velocity, a top-down shooter that I admittedly haven’t played. With that said, Velocity focused exclusively on the Quarp Jet. The focus on high-speed action was still there, but the entire game was relegated to a top-down perspective. 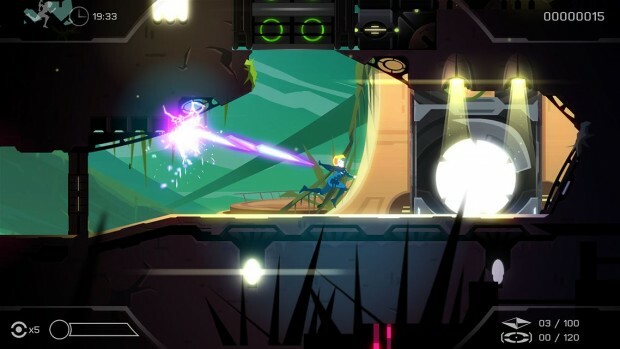 In Velocity 2X, you get to take the bionics-enhanced, Ellen Ripley/Sarah Connor-inspired Lieutenant Kai across 50 levels that dance between exciting top-down rides in the Quarp Jet to side-scrolling platforming segments with Kai going in on-foot. There’s lots of upgrades to collect as you go, too, ranging from the Quarp Jet’s crazy laser light shows (Death Blossom, anyone?) and easily spammed mines to Kai’s teleporting hijinks, which handle exactly as the Quarp Jet’s. There’s even a wrist laser that can eventually be upgraded to fire while on the move. There’s lots of gameplay variety here, and Velocity 2X throws another bone for you every couple of levels to keep things fresh. A passable story –- Velocity 2X ‘s story falls victim to cliches a bit too often. While the writing is fine and the characters are given some paper-thin amounts of character development, too often it feel like it’s just there to fill in the time between each of the game’s 50 levels. And that’s fine, considering Velocity is more of an arcade-y action game than an emotional, story-driven experience. But I couldn’t help but feel that because it doesn’t feel like it needs a story, it would have been better off without one. Lots of baggage –- If there’s one thing I like about platformers, it’s that they try to keep things simple. And that’s great for games like the Dustforce or the aforementioned Super Meat Boy, because the simple design keeps levels feeling consistent while allowing developers to add new threats and intricacies to levels to make them more fun to explore with something you’re already familiar with. Even the classic Super Mario Bros. handled this well, occasionally giving players a power-up to ease the challenge a bit while always making sure players could finish the game with what they started. Velocity 2X isn’t like that, however; it’s constantly giving you new threats and new items to use as you play. The core gameplay of zipping down lanes, blasting enemies and docking your ship for a quick jog works great, but it starts to feel really overwhelming when things like overcomplicated puzzles and a second ship to pilot are simultaneously thrown into the mix. 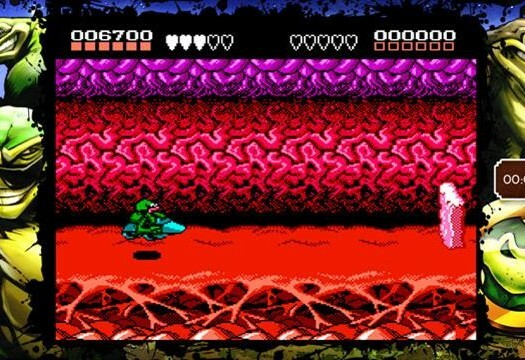 While early levels are short and can be beaten in about a minute and a half, later missions can take as much as twice that, depending on your level of skill. I’m no stranger to improving an experience with new features, but Velocity 2X gets a little feature-happy sometimes, which bogs down the experience a bit. It’s no deal-breaker, but it is disappointing. There’s a great time to be had with Velocity 2X, especially if you enjoy games that challenge your reflexes with levels that go by at blistering speeds and feature hosts of bullet-spamming enemies to dodge. 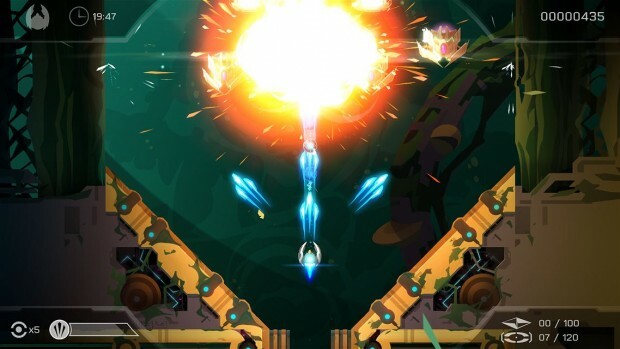 It’s a very simple game at its core, and that’s the greatest strength of Velocity 2X — you can go from beginner to pro in a matter of minutes, so long as you know what you’re doing. It’s not the ultimate pick-up-and-play game, but it’s certainly worth picking up and playing. 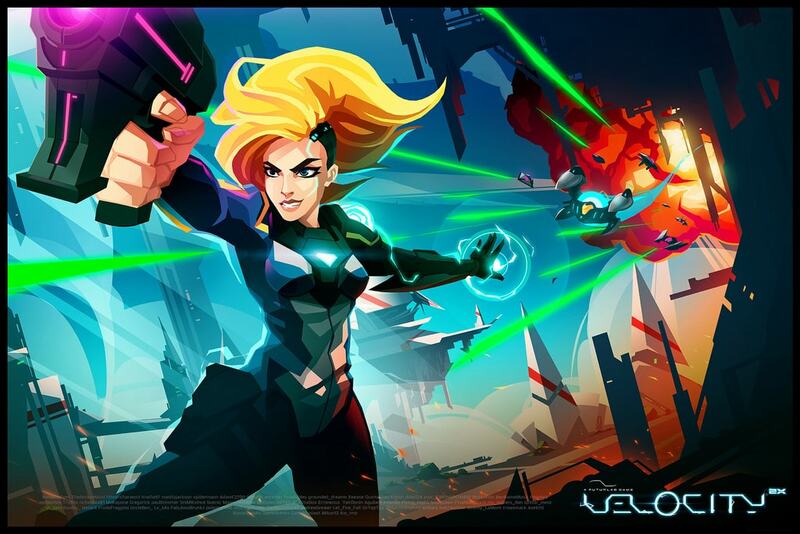 Velocity 2X was developed by FuturLab and published by Sierra on Xbox One. It was released August 19, 2015 for $19.99. A copy was provided by Sierra for review purposes.